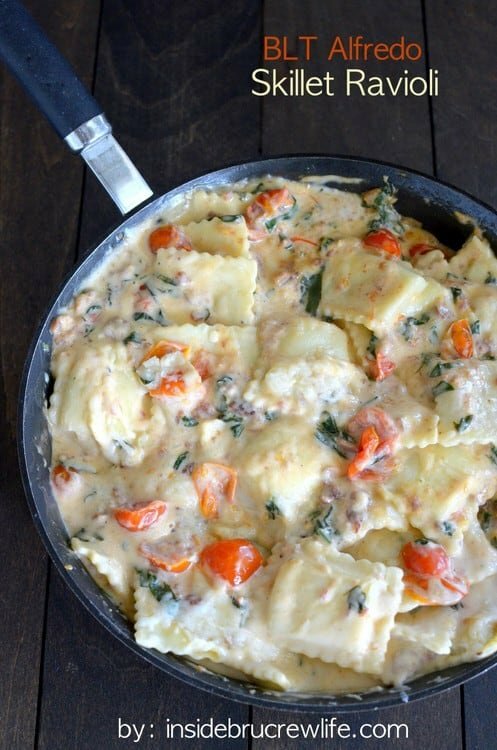 Bacon, spinach, tomato, and Alfredo sauce makes this easy skillet dinner a family favorite. 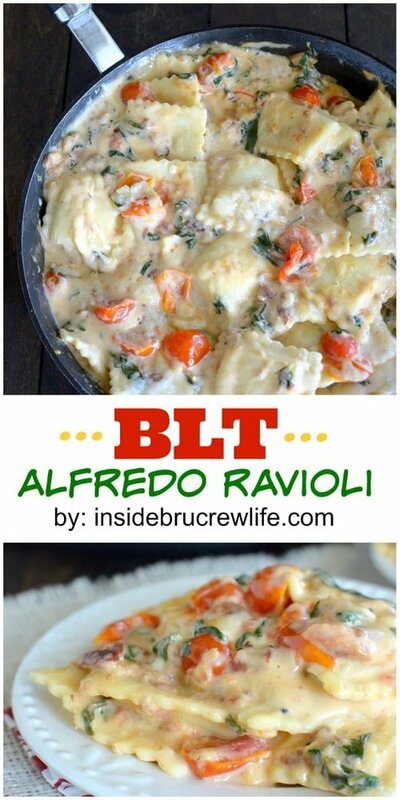 This BLT Alfredo Skillet Ravioli got a thumbs up from our kids when we served it for dinner. Add it to your menu rotation and see why it got rave reviews. Seriously, I am not usually the brains behind our dinner meals. All day long I work on desserts, so when it comes to dinner time I just kind of space out. I can be staring at an entire fridge or cupboard full of ingredients and still have no clue what to make. 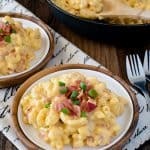 Thank goodness my husband loves to cook, otherwise it would be cereal and mac & cheese most nights with the occasional pizza or corn dog thrown in there! The other day I was walking through the grocery store and spotted ravioli. It has been forever since we had that as a dinner, so I picked up two bags of the frozen ravioli. I wasn’t sure what I was going to do with them and when, so I opted for frozen over fresh. You can use either in this recipe though. When I got home, I happened to see a jar of Alfredo sauce in our cupboard and thought it would be a nice change from red sauce for the ravioli. Although I still wasn’t sure what else to do with it. Then a few days later we were cutting up some veggies for a Veggie Salad, and I started thinking about how cherry tomatoes might work with the Alfredo and ravioli. From there my brain went wild thinking about flavor combos, but the one that stuck out the most was BLT. 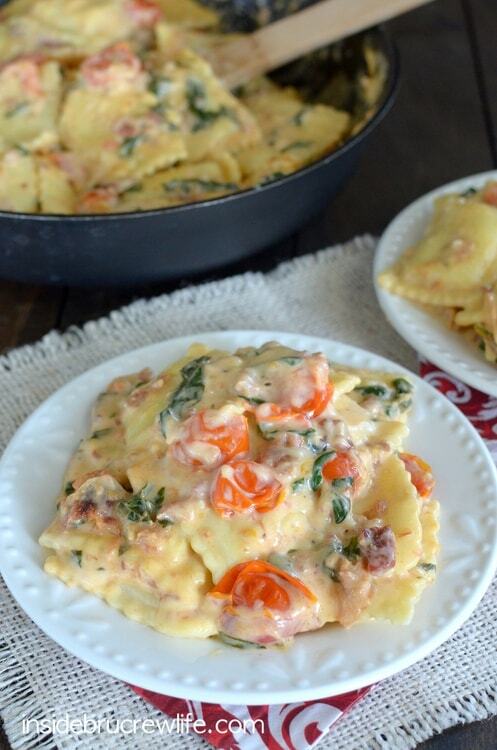 I love me some bacon, lettuce, and tomato sandwiches, so why not add that to ravioli, right? Of course lettuce doesn’t cook so well, so I used spinach in place of it. This skillet dinner is perfect for busy nights. I used mostly prepackaged items to save a little bit of time, but feel free to do any of it homemade if you want. Cook the ravioli according to your package directions and keep them warm. While they are cooking you can cut up the cherry tomatoes and spinach. We also have a big bag of bacon crumbles in our fridge, so I totally cheated and used that in place of fresh bacon. Go with whatever works for you! I just happen to be a total recipe cheater when it comes to making dinner! Saute the veggies and bacon, toss in the cooked ravioli and sauce, and top it with a little cheese. Boom! Dinner is ready in about 20 minutes! Gotta love easy meals that everyone loves!!! My kids keep asking for this again…so, it’s a good thing I bought 2 bags of ravioli!!! 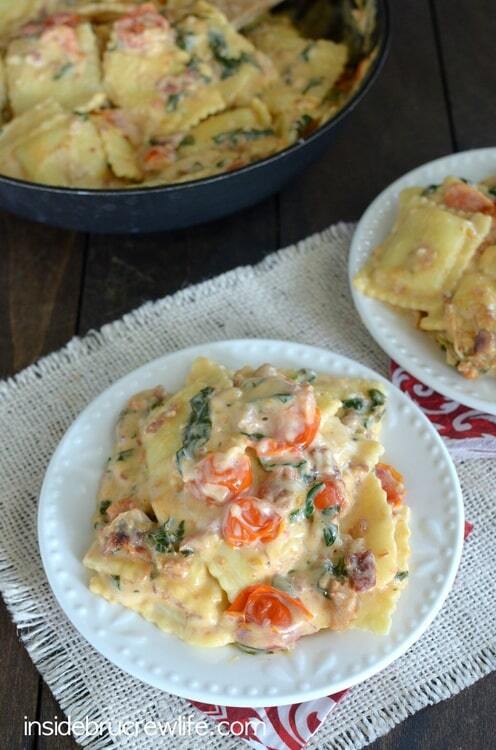 Adding spinach, tomatoes, and bacon to Alfredo sauce makes a delicious and easy dinner when added to cheese raviolis. Cook the ravioli according to the package directions. Drain and keep warm. Heat the olive oil in a large skillet. Add the halved tomatoes and sauté for 2 minutes. Add the spinach and bacon and cook for another minute or until the spinach wilts. Toss the cooked ravioli with the veggies. Stir in the Alfredo sauce and heat for 1-2 minutes. 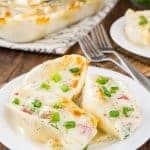 Top with cheese and let melt. Serve immediately. Makes 5-6 servings. Looks like the entire family would love this! Love the cheesy, gooey factor 🙂 Pinned! It is definitely a family friendly recipe! My kids gobbled it down! Thank you so much for the pin love! Oooh, my kids would love this! And I’d love how simple it is! Perfect for a quick dinner! This looks and sounds incredible. I will have to give this one a try! 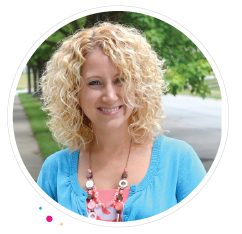 Love your wonderful blog, Jocelyn. Nothing better than a BLT recipe with raviolis!!! My family is going to be SO excited. Thanks for sharing! 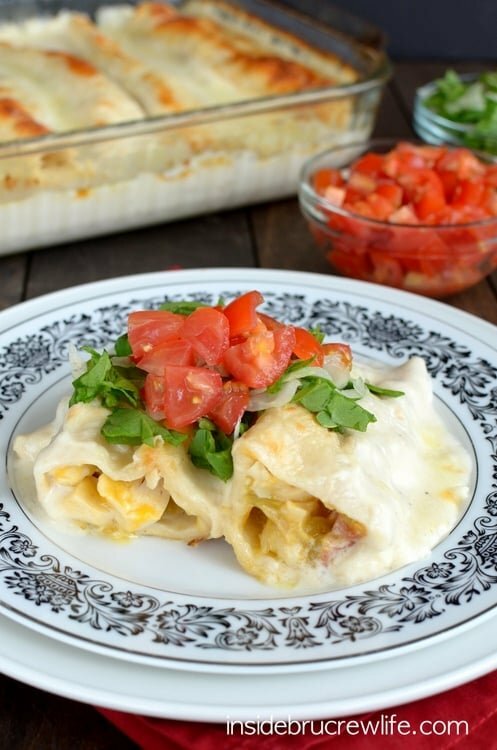 I absolutely love this and can’t wait to add it to our dinner menu soon! Woo hoo! I hope your family enjoys it as much as mine did!!! how did you know I was craving posta?! MMMM my mouth is watering already! I always crave pasta!!! It’s my favorite!!! Like you, I sometimes feel overwhelmed when it comes to dinner. 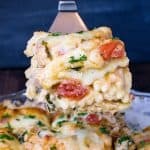 Baking ideas run rampant in my mind, but cooking requires extra brain power sometimes…Loving the ease of this skillet meal; who doesn’t love BLT’s and cheesy ravioli? I’m so glad I’m not the only one who feels that way!!! Cheese and BLT = match made in heaven for sure!!! I love quick and easy dinners like this, especially when they look as delish as this pasta does! 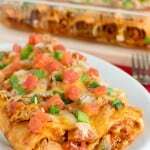 School starts on Tuesday, need this recipe in my rotation! Quick and easy dinners are the only way I will get dinner done! I hope you get a chance to try this one out soon! 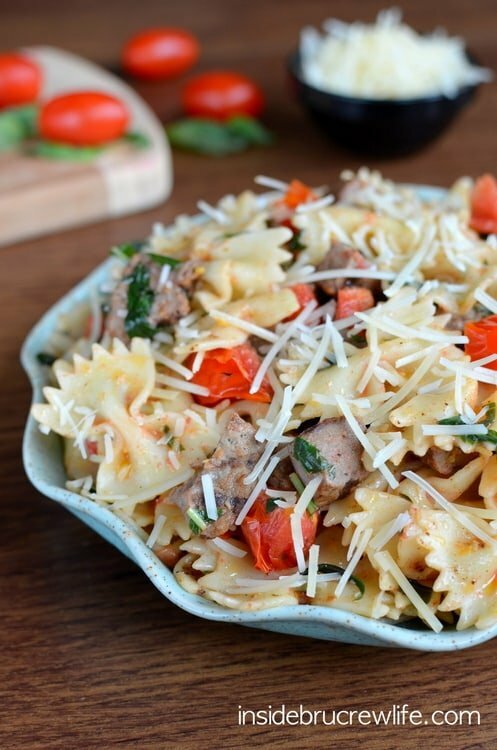 This pasta looks completely amazing! 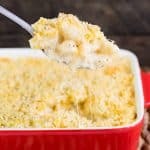 Talk about an amazing comfort food on a cold night – this is perfect!! Looks wonderful! This would be perfect for a busy night dinner! I haven’t had ravioli in forever. Thank you! We hadn’t had ravioli in a while too, so I’m glad I tried this one!!! Oh wow! This looks so yummy!!! I really want to try it. Thank you so much girl!!! It’s fun playing with cheese for dinner!! I haven’t even tasted this yet and it’s already my new favorite dinner. No pressure or anything. Haha! Love it!!! No pressure indeed! The BLT Ravoili dish is beautiful, and soooo delicious. Love the healthy side of it with the spinach and tomato. Your creative side does very well with meal ideas!! Thank you !!! Thank you so much 🙂 I appreciate that!!! 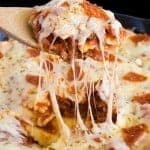 Love ravioli meals like this! Perfect comfort food! I want to meet the person who would turn this down. 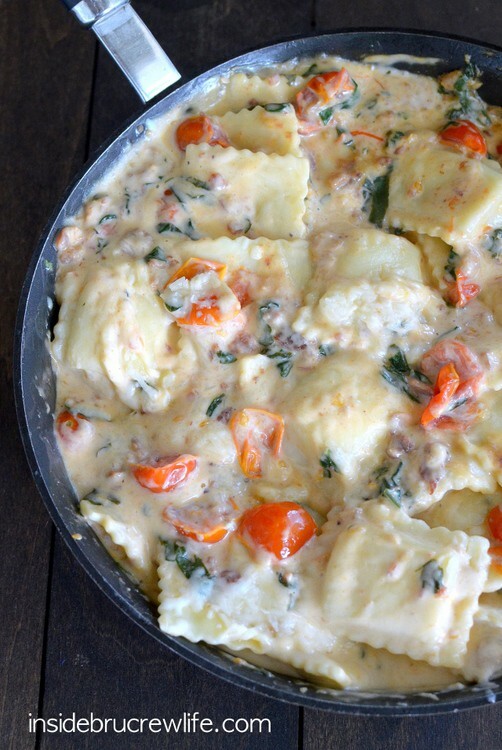 Who doesn’t love bacon, alfredo, and cheese ravioli?? I’d say you are definitely rocking the pasta dishes! This would be a huge hit. Pinning! Carbs and cheese…best way to do dinner, right? 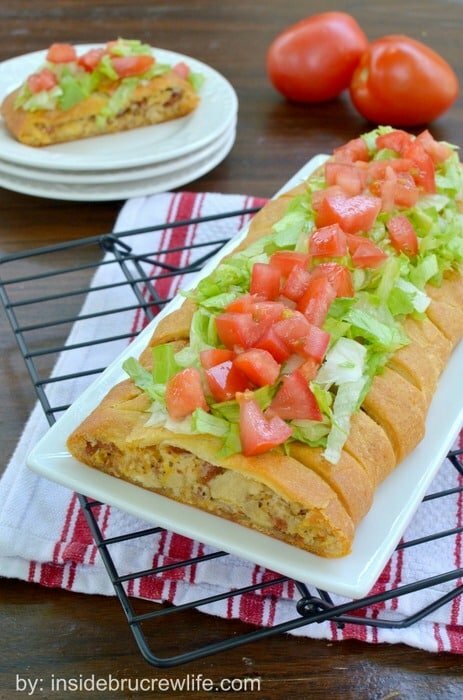 This looks so gooey and delicious – no wonder everyone loved it! Mmmm! My kind of dinner – easy but looks like I fussed! (shhhhhh!!!) Love it, Jocelyn! There are so many things happening here that I love. 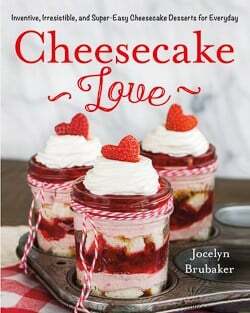 Bacon, skillet dinner, alfredo… This one is a real winner, Jocelyn! Mmmm, that looks great! I can never say no to pasta.